The lecture on March 28 will discuss diagnosis, treatment, and the most advanced surgical options for carpal tunnel syndrome. 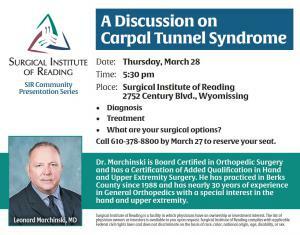 WYOMISSING, PENNSYLVANIA, UNITED STATES, March 12, 2019 /EINPresswire.com/ -- The Surgical Institute of Reading will host a guest lecture by Doctor Leonard J. Marchinski2 entitled “A Discussion on Carpal Tunnel Syndrome” on March 28, 2019, as part of the SIR Community Presentation Series. 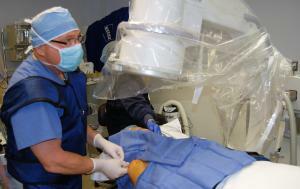 The Surgical Institute of Reading is a surgical facility accredited by The Joint Commission. It has national recognition for the level of care provided patients in the areas in and around Reading and Wyomissing, PA. The physician-owned hospital provides a full range of services for patients, including general surgery, pain management, spinal surgery, and plastic surgery. 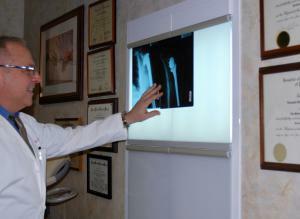 Dr. Leonard J. Marchinski is a medical doctor in Pennsylvania, focusing on orthopedic surgery. 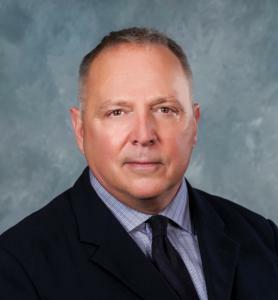 Dr. Marchinski provides medical and surgical treatments such as Endoscopic Carpal Tunnel Release and treatment of similar Nerve Compression Syndromes. Many people hear and talk about “Carpal tunnel syndrome” when their wrists hurt, but few understand how such condition is diagnosed and treated. “Carpal tunnel syndrome” is a common condition that causes numbness and tingling in the hand and arm. This medical condition occurs when the median nerve (one of the major nerves to the hand) is compressed. For most affected people, this condition worsens over time. Initially, the symptoms can be alleviated with non-surgical solutions, such as a wrist splint and steroid injections. There are certain risk factors which increase the risk of Carpal Tunnel syndrome, such as heredity, repetitive hand use (in office settings, for example), and other health conditions such as diabetes and rheumatoid arthritis. Finally, sometimes surgery is required, called "carpal tunnel release." Essentially, the types of surgery used increase the size of the tunnel and decrease pressure on the median nerve. Date, time and location of the Lecture: Thursday, March 28, 2019, at 5.30pm at the The Surgical Institute of Reading. RSVP by calling 610-378-8800.